A chicken farmer went to a local bar…. sat next to a woman and ordered a glass of champagne. Due to its geographic location, and wide exposure to different parts of the world, Hong Kong developed some uniqe food that is an assimilation of various food culture. The below food items (marked with **) are my top favourite 10 Hong Kong food, I strongly recommend you to try them all. Happy Bun Bakery, Queen’s Road East, Wan Chai, Hong Kong. Exit C1 of MTR Admiralty station, walk east bound along Queensway, which continues to Queen’s Road East, Happy Bun bakery will be on your left. Ask if they have freshly baked pineapple buns, you just want to eat it when it is still burning hot! New Blue Pool, Caine Road, Mid Levels, Hong Kong. Exit D1/D2 from MTR Central station, walk southwest bound, turn right on Queen’s Road Central, you will find a mid-level esculator in front of 100 Queen’s Road Central, take the esculator up, exit at Caine Road, walk west bound along Caine Road, New Blue Pool Bakery will be on your right. Tai Cheong Bakery, 32 Lyndhurst Terrace, Central, Hong Kong. Exit D1/D2 from MTR Central station, walk southwest bound, turn right on Queen’s Road Central, you will find a mid-level esculator in front of 100 Queen’s Road Central, take the esculator up, exit at Lyndhurst Terrace, walk west bound along Lyndhurst Terrace, Tai Cheung Bakery will be on your right. beverage – milk tea(**), red bean ice. They are served at every tea cafe. Milk tea has a well-known nickname, stocking milk tea, as tea cafes use a stocking-like bag to filter out tea leaves. Milk tea and red bean ice might be available in other types of eateries but cannot compete with those served at tea cafes. snack – egg roll**(plain, or with shredded meat and/or seasame inside), almond cookie**(plain or chunky style), chicken pie, curry puff, small egg puff**(492 King’s Road, North Point, Hong Kong). breakfast – rice roll wrap donut**. Many Chinese-style breakfast stores sell this item, but the best ones are those with smooth warm rice roll and crispy donut, served with soya sauce, you have to eat it fast so the donut does not get soggy. Ocean Empire maintains this quality quite well, just ask for exchange if you are not satisfied with the quality, this dish at Ocean Empire is called ‘Twisted Doughnut Ricesheet Roll’. Another common breakfast item is turnip cake, the most famous turnip cake shop is Wai Kee Congee Shop (82 Stanley Street, Central, Hong Kong. Exit D2 of MTR Central Station, then walk westbound along Queen’s Road Central, right on Cochrane Street, right on Stanley Street, the shop is on your left), it is recommended by many local food critics. Also try rice roll and minced beef congee. fried noodle**(crispy style) – served at tea house at dinner time. lobster in cheese sauce** – Chuk Yuen Seafood Restaurant makes extraordinarily tasty cheese sauce. Prince Edward Road West (near South Wall Road), Kowloon City, Kowloon. Cash only. To get there is a bit tricky as MTR does not have access to it. Take bus route 101 or 111 ( from Hong Kong Island) outside Vicwood Plaza, 199 Des Voeux Road Central, Sheung Wan, (from Kowloon) at Tsim Sha Tsui East / Hung Hom Station, get off at the station of Argyle Street Playground, Ma Tau Chung Road. An easier way is to take a taxi from MTR Mong Kok station. 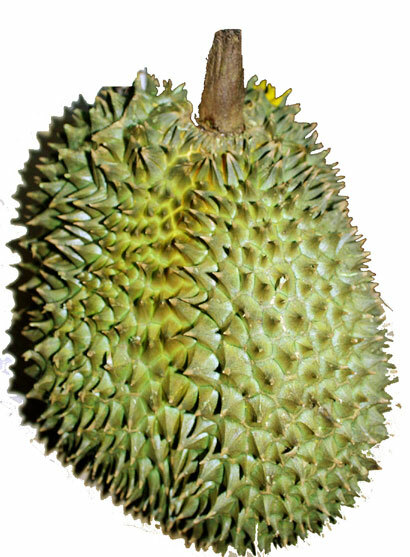 • 1 – Durian fruit – Yes, durian isn’t all that exotic in many parts of the world. 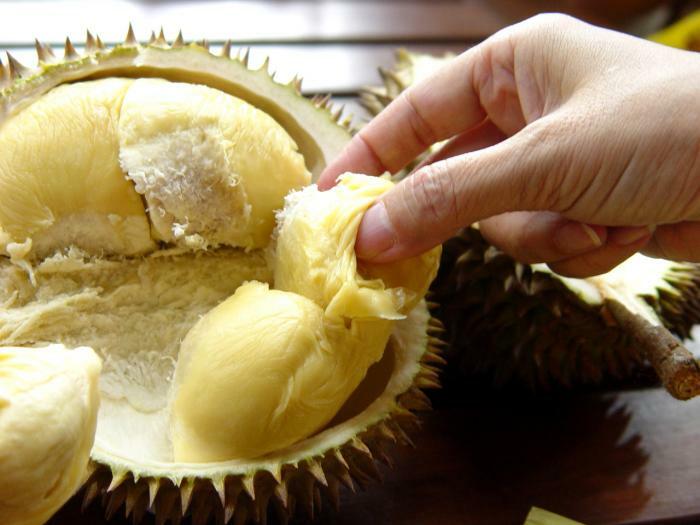 But here in the States, it’s hard to find fresh durian, and its rotting odor still makes this a choice for adventurous eaters. • 2 – Frog legs – Again, a familiar dish in many regions. But still one we’ve never tried. • 3 – Reindeer paté – Rudolph in a can? We’ve heard this is meaty and delicious. • 4 – Bird’s nest soup – Ever since we read about this in National Geographic when we were kids, this exceedingly expensive soup has been fascinating to us. • 5 – Mangosteen – They are slowly becoming more available, after a ban on their import was lifted, but we still have never seen one! We want to try this King of Fruits! Read more about mangosteen here. • 6 – Balut – The embryo of a chicken or duck, still in its shell. A delicacy in some regions of Asia, but we’re too chicken to try. See one guy’s account of trying this. • 7 – Casu marzu – A cheese from Sardinia that has live maggots inside. We could never do it! • 8 – Kopi luwak coffee – We are huge (huge!) coffee lovers and conoisseurs, but that doesn’t quite stretch to coffee pooped out by an animal. • 9 – Roasted beetles – They’re greasy, salty street food snacks in many parts of the world, including China. But eat a cockroach? No way! • 10 – Fish sperm sashimi – Even Kathryn, the most intrepid eater we know, said she wishes she could take back eating this. Preliminary research suggests that eating fatty fish, which are high in long-chain omega-3 fatty acids, may lower the body’s production of prostaglandins, hormone-like chemicals that can induce inflammation and pain, causing migraines. “We found that adolescents who took 1.25 grams of fish oil daily for two months experienced fewer headaches, which were less severe and didn’t last as long,” explains Zeev Harel, MD, the lead researcher on the study and an associate professor of pediatrics at Brown University. 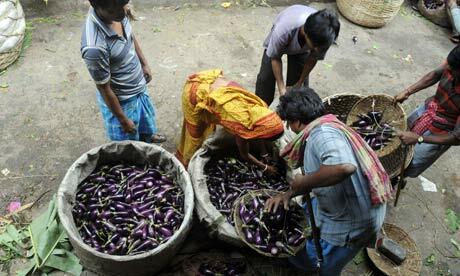 An Indian vendor sells aubergines at a wholesale market in Calcutta. India‘s poverty line has always been a matter of huge debate, but it was a discussion mostly confined to economists and policymakers. But the matter has now gone public, following a row about an affidavit from the planning commission to the supreme court of India, in which the official poverty line was set at 26 rupees (around $0.53) per person per day in rural areas and 32 rupees in urban areas. This can only be a good thing, because the official attempts to measure poverty are not just arcane, but riddled with contradictions. How exactly are these numbers arrived at? The measure was developed in the early 1970s, when a group of experts decided the appropriate line would be set according to the average monthly consumption expenditure of households whose members consumed (per capita) 2,400 calories of food per day in rural India and 2,100 calories per day in urban India. Subsequently, the poverty line has simply been updated using consumer price indices. These numbers now have little to do with actual calorie consumption because food consumption patterns have changed. However, the use of that line has been defended by official sources who have argued that, at that level of expenditure, families could afford to buy minimum food and have simply chosen not to. Of course, this begs the question of whether it is really choice or the urgent need to consume other items (energy, healthcare and so on) that determine patterns of spending. Nevertheless, it is precisely this line (annually updated by consumer price indices) that has been used to describe the extent of poverty in India for decades. This was roughly similar to the World Bank’s estimate of $1 a day (now $1.25 a day) per person, not at nominal exchange rates, but at purchasing power parity (PPP) exchange rates. In recent times, various committees led by economists have come up with different ways to measure the extent of poverty. The official line delivers a poverty rate of around 32% of the population. A committee under Suresh Tendulkar estimated it at 37%, while another led by NC Saxena said 50%, and in 2007 the Arjun Sengupta commission identified 77% of Indians as “poor and vulnerable”. The World Bank’s PPP estimate of Indian poverty was higher than 40% in 2005, while the Asian Development Bank arrived at almost 50%. The UNDP’s Multidimensional Poverty Index finds the proportion of the poor to be higher than 55%. All this even sounds ridiculous. And if it were simply a question of measuring the extreme poor and tracking the extent of extreme poverty over time, this discussion could indeed be left to the social scientists. But what has made it matter – for all the wrong reasons – is that these arbitrarily drawn poverty lines have been used to determine the extent to which citizens receive subsidised access to essential goods and services. Since the mid-1990s, various government schemes have differentiated between the categories of “Below Poverty Line” (BPL) and “Above Poverty Line”(APL), and it was announced that a whole range of subsidised goods and services – from cheaper food grain in the public distribution system to subsidised healthcare to access to funds for basic housing – would only be available to BPL households. Since India has a federal system, state governments are in charge of delivery of all these goods and services, and they have to decide which households are most in need through surveys. In fact, many state governments have taken a more realistic view of the people in need and issued “BPL” cards to many more households than those recognised according to the official poverty line. In some southern states, for example, significantly more than two-thirds of rural households have BPL cards. But the central government allocates resources (both money and food grain) to the states on the basis of the national poverty estimates taken from the national sample survey, which is based on the official poverty line. State governments that provide these goods and services to additional households have to finance the extra ones themselves. As they have faced hard budget constraints, this has become increasingly difficult. That is why the poverty numbers are such a bone of contention. We do not consider the official national poverty lines set by the planning commission, at 32 and 26 rupees per capita per day for urban and rural areas respectively, to be acceptable benchmarks to measure the extent of poverty in India. In any case, irrespective of the methodology we adopt to measure poverty, the number of poor and hungry people in the country remains unacceptably large. While academic debates can continue on the appropriate measure of poverty in India, its extent and whether it is decreasing over time, we strongly believe that it is unacceptable and counterproductive to link the official poverty estimates to basic entitlements of the people, especially access to food. Official surveys of nutritional intakes and outcomes indicate that undernutrition is much more widespread than income poverty, however defined. It is also widely recognised that the targeted public distribution system (PDS) introduced since 1997 has done more harm than good by creating divisions even among the poor and has led to massive errors of exclusion. Recent evidence clearly establishes that states which have moved towards near universalisation of the PDS have performed much better in increasing offtake and reducing leakages. Restoring the universal PDS appears to us as the best way forward in combating hunger and poverty. This is not only feasible within the available fiscal space of the Union (central) government but must be a policy priority in the backdrop of high and persistent food price inflation. Following the controversy, the government has now declared that it will take into account multiple dimensions of deprivation for arriving at specific entitlements that rural households will receive, and that the current poverty estimates based on these declared numbers will not be used to impose any ceilings on the number of households to be included in different government programmes and schemes. We still have to see how this will play out, but here is a first step in the right direction. • This article was amended on 4 October 2011. The final paragraph has been updated following the Indian government’s announcement on Tuesday that it would not cap poverty numbers. The paragraph had read: “This is something the government should pay heed to – otherwise, the growing perception is of a governing coalition that is not only riddled with corruption, but full of Marie Antoinette-style insensitivity.” This has now been changed. TONY EASTLEY: Britain is facing its biggest food scare since mad cow disease and it’s spreading to Europe. The UK is waiting on tests to see just how many beef products in the food chain might be contaminated with horse meat and if the products carry any risk to humans. In the past month there’s been a string of revelations about pre-prepared and frozen beef items reaching Britain, Ireland and France. It’s raising questions about the integrity of the European food chain. The British Government suspects organised crime might be behind the meat substitution. MARY GEARIN: Britons sitting down to their Sunday dinners may well have paused over their plates of beef if they were made from imported frozen or ready-made products. The UK’s environment secretary Owen Paterson says what started as potentially isolated cases of bad labelling and testing could become a case of organised crime. OWEN PATERSON: It’s completely wrong that a British consumer should go to a store, buy a product clearly marked beef and find that it actually contains a cheaper product – horse. So this is actually fraud on the public. And I personally, I think it’s either a case of gross incompetence amongst suppliers further down the chain or, and I’ve got reason to believe this is looking increasingly likely, it looks like this is an international crime. MARY GEARIN: Food retailers have been told to carry out their own tests on all processed beef products after it was found some of the Findus brand of beef lasagne products contained up to 100 per cent horsemeat. Findus is now considering legal action against its French-based suppliers who in turn are pointing the finger at Romanian abattoirs. The Romanian government has launched its own investigation. This all follows the first cases in Ireland three weeks ago – 10 million low price burgers and last week, frozen spaghetti and lasagne meals made by a French food manufacturer. Jose Bove, a Green member of the European parliament, says the issue how hard it is to ensure food safety across the continent. JOSE BOVE: It’s a European problem now and it’s a problem of how these things happen. I believe it’s because there’s a real net here organised to change the origin of meat to make more money. MARY GEARIN: The British government has now ordered its Food Standards Authority to conduct DNA tests every three months. But it’s ruled out a temporary ban on imports, saying it would break European Union rules unless there’s a proven health risk. That’s a pertinent question in a country still deeply scarred by the mad cow crisis. Chairwoman of Britain’s House of Commons food and rural affairs committee Anne McIntosh has called for suspension of meat product imports and questioned the response from British food safety authorities. ANNA MCINTOSH: What worries me about – there’s been a delay in the testing, the FSA Ireland started the testing already in November. They’re already ahead of this. I understand that there’s not been much testing of meat for the last year. I think only 800 tests were done in the last year. MARY GEARIN: While Scotland Yard has met with the food safety officials it hasn’t launched an official inquiry yet. This is Mary Gearin in London for AM.